Judging from our current relative prosperity, it might be difficult for some to imagine that during the period of the Revolutionary War, there were many people who disagreed with becoming an independent country. There were some who believed that America’s connection with Britain would be instrumental in securing the country’s happiness. Yes, America did reap some benefit from the relationship, but I certainly do not have to provide much evidence to assert that the benefits received from Britain were nothing that America couldn’t supply on Her own. Add to this the many offences of King George, and the only motivation to be found for the nay-sayers is fear. I have a personal appreciation for brute honesty when it is necessary. I have a similar appreciation for observations made generations ago that still hold true today; this reinforces the reality that human nature does not change. The last of those three quotes really hits home for some of my observations on the pre-Tea-Party GOP. In particular, that well-received ‘reaching across the aisle’ behavior exhibited by the Republicans in the past 30 or so years has greatly weakened the credibility of the Republican Party, and weakened the country as a result. The Democrats were able to slowly work in their policies inch-by-inch, completely undetected by the average citizen. Somehow, being described as ‘moderate’ became a good thing. Admittedly, this isn’t always bad, but when charged with securing individual liberty, it’s best to be uncompromising. I’d make a wager that any erosion of freedom eventually results in an overwhelming loss unless fought. For an example of this phenomenon, please see the 16th amendment in your copy of the U.S. Constitution (keep in mind that the income tax imposed by the amendment began at 1% with an individual income of the 2008 equivalent of $64,000). In the 1994 Congressional campaign, the GOP developed a contract with America, promising to return to conservative ideals. 16 years later, after being plagued by many of the same problems, the Republicans of the 112th Congress wrote a similar pledge to America in 2010 to center themselves on their ideals once more. So far, I think the Republicans of the 112th Congress have been doing very well. They are showing that they are making good on their promises to cut spending by introducing weekly bills to slowly starve the federal beast. In wake of the budget crisis temporarily resolved just last night, I earnestly would have looked forward to a temporary government shutdown. I think it would have served as a fine example that the sky would not fall on America, and perhaps that the country isn’t nearly as helpless and dependent as many people perceive. Regardless, the Republicans made some head-way in resolving the budget problem. Although there was more than a bit of compromise involved and they ended up with about half of the cuts they wanted, it certainly seems like a step in the right direction. I believe there are two states of mind in compromise, one in which you get trampled, and one in which you fight. I’m fighting my cynical nature and will call the budget compromise a gain since the Republicans do appear to be fighting. I also believe there are three end results to compromise: a negative compromise in which one party ends up with an overall loss, a positive compromise in which there is an overall gain, and an ugly middle ground, where both parties appear to be very busy, and both parties wind up with mediocre results. Giving in to my cynicism a bit, I think that last result appears as if it could go on forever. It clearly does not take long for a body of people to return to the same compromising, destructive behavior, and there is unimaginable difficulty on the road to returning to the uncompromising ideals of the foundations of this country. This is what power wielded without accountability leads to; Paine warned of this. Let us pray that the Tea Party remains strong to keep our representatives in check. In earnest, I wish it weren’t necessary to have an organization such as the Tea Party at all. Truth be told, if not for the decline in Judeo-Christian ideals in the past few generations, I believe the act of holding public officials’ feet to the fire would be left to a much larger group of interested individuals: every one! I must admit, our current situation is not Congress’s fault. We the people compromised on our principles and political involvement long before we could begin to blame Congress. Could it be true that the KISS (Keep it Simple, Stupid) concept was conceived in 1776? Perhaps earlier? Mr. Thomas Paine certainly made no compromise when explaining the woes of complex government. He writes, “I draw my idea of the form of government from a principle in nature… that the more simple any thing is, the less liable it is to be disordered, and the easier repaired when disordered.” He continues to remark on the ineffective English Constitution. When it was instituted, it was a step in the right direction for human rights, but at the time of Paine’s writing it was incapable of delivering its promises. I decided to read the English Constitution that Paine refers to myself, but I was unable to find a single, exhaustive document. What I found was that the operative documents of the UK, England, and Scotland are referred to as ‘unwritten constitutions’. Also described as ‘partly unwritten, wholly uncodified’. To this day, England’s (and the UK’s) constitution is based on largely unwritten rules which serve as the shaky foundation for various treaties and acts which bind the United Kingdom together. Can a populace truly have confidence in an arrangement like this? Can they count on consistency of law? How can it set clear bounds to limit the abuse of power? Perhaps those in power prefer the ambiguity. (I was able to find a document which resembles a constitution, and apparently took effect in August of 2004 [more on this subject in the YouTube clip at the bottom of this post]). What a novel idea for a country’s instruction manual to be found all in one place. I can liken the UK’s lack of a single, definitive document for their government to a professional sporting event where all the teams play by different rules. Since no definitive rulebook exists, the referees would be made to invent rules on the spot to promote fair competition, and would likely be unable to enforce their impromptu rules effectively. Neither the teams, nor the fans would be able to count on the rules remaining consistent as the referees may not be able to agree, and the fundamental play of the sport would be subject to their whims and could change at any time. It might be fun to watch the incoherent gaggle run around on the field for a while, and hope for the occasional fight to break out, but the fans who exchange their money for the promise of competitive show will eventually lose interest and likely find other outlets for their entertainment. My analogy assumes free will, of course. In reality, the people of the UK (the fans) have no choice but to endure watching the nonsensical play on the field, since the government (the team owners) operates on coercion. The UK lacks a single, core rulebook to keep those team owners and refs in check. I note some similarities in the English constitution with our current state of affairs. I may actually have to give more credit to the Brits in this regard. Their state has never made any direct promises in regard to the foundational rules of their government, so the haphazard nature of their laws and treaties are a natural result. Our current situation is the result of seeds of hypocrisy methodically planted in our culture decade after decade so that now, our Congress is able to pass laws with ease that our constitution was written expressly for the states to mitigate. At least the Brits have remained consistent in their inconsistency. Framers' intention for power. 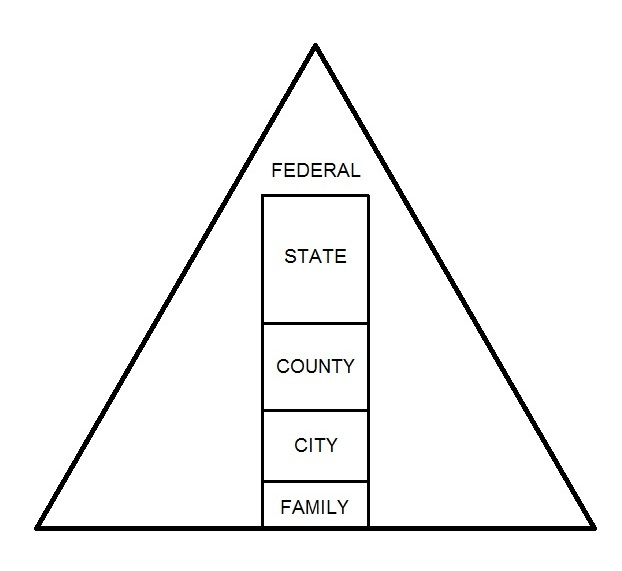 The more surface area in the triangle, the more power is granted to that part of government. Note that the federal government is not contained in the triangle, but was intended to oversee the matters between the states. Each triangle is a separate state. Of course, you don’t have to agree. You don’t have to acknowledge the purpose for the tenth amendment in the U.S. Constitution was expressly written to limit the power of the government from instituting whatever laws our elect see fit. You don’t have to recognize that for the first time, beginning in 1913 with the advent of the progressive era and the passing of the 16th amendment, our constitution began to increase the size and power of the government, and contravened the very principle of the document completely. You don’t have to agree with U.S. Representative John Hostettler’s (R-IN) observation that, “The Internal Revenue Code and regulations add up to one million words and is nearly seven times the length of the Bible.” And of course, you don’t have to agree with my logical conclusion that between the government and the people, the people surely aren’t benefiting from this complex governance that our founding documents were written to prevent. I’d sure be surprised if someone came to a different conclusion based on the evidence. My liberal friends, I await your observations. We’ve been given a tremendous gift in our founding documents. A gift that may be long forgotten but is still in effect! As I write this, the state of Idaho is considering an official refusal to adopt the Affordable Care Act (aka. ‘ObamaCare’). My hope is that this exercise of the tenth amendment results in a snowball effect that takes our nation by storm. In our current day, it’s exactly as Paine observed. Political physicians of every sort – namely, modern liberals, or ‘progressives’ – are prescribing different medications for the problems in our country. Invariably, all of these narcotics seem to result in increasing the size of the federal government. We’ve already been given the only medicine that’s been proven to work: less medicine, more exercise (less external government, more personal responsibility). It’s been done before, and it can be done again. Let’s go, America! The Constitution was written to establish the tranquil garden of limited government. As ‘we the people’, it’s our job to keep the hedges trimmed to keep our government manageable. Though I fear the overgrowth is so prolific now, we may have to burn the fields down and start over. I leave you with a couple of YouTube clips that made a serious impact on me a couple of years ago. It seems that sometimes, the best observations are made by outsiders. The following is a speech given in Colorado by Daniel Hannan, a conservative MEP (Member of European Parliament), regarding our constitution. If you don’t feel like watching the full 15 minutes, watch the first clip starting at 6:53. And please, leave your thoughts in the comments section! Okay. So unilateral power is not a phenomenon derived from nature. How does it happen? Paine clearly thought that this was a very important question to ask. He says that as humans, we are made male and female by nature, we determine right and wrong by the laws of God, but how men come to control other men as if they are a new species requires some exploration. To begin this exploration, Paine asserts that according to the chronology of scripture, there were no kings in early ages of the world. As a consequence, there were no wars. He claims that the pride of kings is what throws the masses into confusion. He states that government by kings was first introduced into the world by heathens. Exalting one man above other men cannot be justified by nature. It can’t be defended by scripture either. So much for the divine right of kings. Paine writes that the part of scripture that reveals God’s disapproval for monarchy is swiftly glossed over in monarchies. One of the chief examples of where a kingship derives this imaginary right is when Jesus was quoted as saying, “Render unto Caesar the things which are Caesar’s.” Paine states that this is not a justification for kingship, as the Jews did not have a king at that point in time, and were enslaved by the Romans. Sounds like explicit disapproval of monarchy to me. In a more general sense, I think this can be applied to centralized power in general. Again, the Jews wanted a king by rule of the prophet Samuel. Samuel piously approached God with their request. God gave the Israelites their way, but commanded Samuel to tell the people of Israel the consequences of their request. But Israel still insisted. And they reaped the benefits. Kingship by request is one thing, but even more unnatural is hereditary succession. That is, kingship claimed as a matter of right. How does this absurdity occur? Paine states that in most cases, if one could remove the shrouds of antiquity and trace kingship to its inception, it is probable that the first in line to the crown are nothing more than “principle ruffians” who subtly attained the position of “chief among plunderers”. These kings would provide a measure of safety to the populace which would keep the people satisfied. At this point, no one would even think of hereditary succession as a possibility. Hereditary succession begins not as a right, but as something very casual and convenient. Quite simply, after a few generations of succession, superstitious stories and casual assumption will create the illusion of entitlement. So, after time, what was first instituted out of convenience is then perceived as a right. In other words, the people lose their understanding of history. Paine forcefully asserts that hereditary succession is straight-up, dag-nasty evil. He concludes this point with practical and historical arguments. Kingship almost never produces good and wise leadership (at least without the direct influence of God Himself). Instead, history shows that kingship – or as I infer, centralized power – breeds foolishness and wickedness, and carries inevitable oppression with it. Paine’s poignant, final statement on the subject? Now, I will humbly attempt to draw some comparisons with our current state of affairs and the events in history that Paine wrote about in Common Sense. I’ll start at the top. President Obama. Seemingly elected for who he was rather than for his virtue. I might also add, his undue award of the Nobel Peace Prize instead of the unknown hero whose life it could have salvaged. Just as it is shown in history that a people will assume the divine right of kings in a monarchy, I believe the American people have assumed that the federal government has a right to the same power. I find it interesting that in 1 Samuel, the people of Israel were warned of the consequences of kingship; namely, taking ten percent of their grain and vintage, along with the best fruits of their labor. It is interesting to me because we are currently taxed at a rate of well above ten percent, and this money is taken before you even receive it. The Boston Tea Party was a response to a one cent tax on tea, and it was the cause of the American Revolution! It’s very obvious that we, just like those people living under the monarchies of history, have fallen complacent with this evil and accept tyranny willingly. Case in point: income/property/capital gains taxes. “… make war and give away places.” This example of kingship can also be applied to our current government. War is declared, and battles are fought freely at the whims of the Commander in Chief (originally intended only to be a temporary title for the President in times of war). Though to do this, he simply avoids calling military occupation and engagement as war. In this sense, the formality of declaring war has violated the spirit of the rule altogether. And as far as giving away places? One of the unique aspects of our country was that, as opposed to all other forms of government before it, our country claimed the invention of ‘limited government’. Most of us take this term for granted. But what does this mean? All other governments operated by method of ‘unlimited government’; whatever is not claimed by an individual belongs to the government. The concept of limited government is that whatever is not claimed by the government belongs to individuals. This is truly a revolutionary concept. Here we sit, over 200 years later in the same country, and the meaning of limited government pervades us. We now live in a country where if you ‘own’ a home – even if you own it outright – you still have to pay property taxes. What does this mean when you boil it all down? You are paying the government to allow you the use of your land and home. How very tyrannical. Calling all liberals! Am I out of line here? You call yourselves liberals. Are you really? If I could assume the underlying theme that Paine was trying to get across, it would be that he was warning against any government to take the place of God. As you are about to see, many in our country are continuing to deny that God and His principles were what made this country so successful. The liberal media is perpetuating this falsehood with grace. Lies. Thomas Paine an atheist? Mr. Maher clearly lives in a fact-free environment. My blog hasn’t even claimed to have exhausted the ideas of Common Sense – a pamphlet – and any individual not living in a land of fairies and unicorns can see that every point Mr. Maher makes is an outright deception. To my conservative friends, this is the truth that most of the nation subscribes to. Those in this country that are politically apathetic take what is shown to them in the media as fact. Bill Maher is not the only liberal elitist spreading these lies, though he might be the most brazen. This has to stop if we want to reclaim our country. In response to Bill’s lies, I leave you with an episode of Trifecta which is hosted on the independent Internet based news source, PJTV. For as much anger as I felt watching Maher, this segment makes up for it with equal levity. My apologies for not being able to embed the video! Thomas Paine was not an accomplished man by any social means. In fact, he was a failure domestically, financially, and was academically unexperienced. Undoubtedly, he was the least likely candidate to ignite the spark to separate from Britain. Paine was human, and he recognized this. Common Sense was originally written anonymously when it was published in 1776. Not only did he recognize his humanity, he was courageous enough to confront the colonies of the shortcomings of their humanity as well. Despite his personal failings, he was pragmatic and passionate enough to point out the logical fallacies in the English constitution, and ultimately inspire the revolution of freedom. What Paine outlined in Common Sense did more than placate his desire to promote freedom, or to stir up feelings of bitterness alone. His writings inspired a would-be nation into action. He begins the introduction by validating the premise of his writing. He states that conservatism is not presumed to be popular, and that the status quo, though not exactly wrong, will be thought to be right if given enough time. I believe, in regards to our current state of affairs, most in our country fall in line with this concept. Our government’s current methods are all we know. It does not take long for an ideology to take over a culture, and I hope to write in future postings about how radically our culture has changed in just one or two generations. Paine believed that there was a better way to administer government, and he faithfully continues the pamphlet explaining why and how. He asserts that violence and abuse of power ushers the means to bring its virtue into question. In other words, when we witness injustice, we have a duty to examine it. America experienced abuse of power in spades (read the list of 27 offenses as outlined in the Declaration of Independence, or you can wait until I cover it in the future). He begins the bulk of the pamphlet by defining and explaining the roles of society and government which he contends are very separate. Society is produced by our wants, and government is made a necessity by our wickedness. Society “… promotes our happiness positively by uniting our affections… [government promotes our happiness] negatively by restraining our vices.” One makes patrons, the other, punishers. He admits that government is a necessary evil. He poignantly states that when government makes us suffer miseries that should be found in nations without government, the general reaction is to “…furnish the means by which we suffer.” I don’t believe I am alone when I see the truth of this statement applied to our present day – be it socially, economically, or domestically. Our government which promises security and prosperity seems like it may never stop weaving a web of delayed collapse. I personally contend that the longer we delay in implementing true solutions to our problems, the more violent the consequences will be. Paine points out that the government which governs best does so by ensuring security at the least expense, and greatest benefit. Sounds an awful lot like frugality. I plead for someone, anyone, provide any evidence of frugality in our government today. In my view, any actual frugality in this country has been shifted to ethical businesses, individuals, and the family. 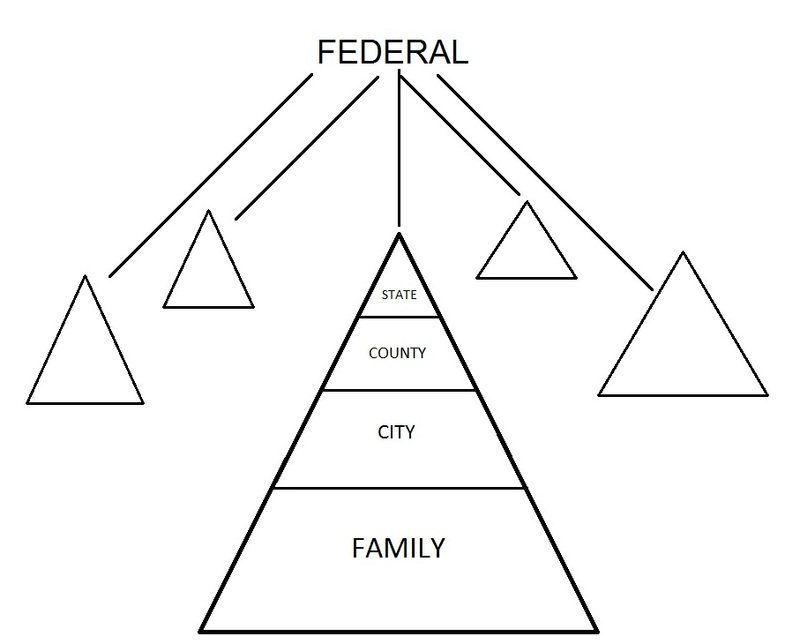 As I hope to illustrate in the future, family is where government starts in the first place. There is a clear divide between the actions of the government, and the virtue of family. In my next post, I hope to explain how this disparity occurs, and the most logical way to avoid this pitfall. After months of wrestling with the idea to start a blog as an outlet for my newfound passion for politics, I have finally found a unifying theme – a necessary attribute to a relevant blog, in my opinion. I’ve chosen the theme after countless dialogues with dozens of people. The most recent of which being my brother, who may perhaps have the most conservative blood of all coursing through his veins, but like so many others I’ve encountered, does not know why he believes what he believes in any exhaustive context of history and true political science. Conversations with others have resulted in many people realizing that they don’t know what they believe at all. This is alarming. So, what’s the theme? Why start a blog? I’ve noticed a trend in the past couple years of which politics and government have caught my attention. Only now – tonight – has that trend become palpable. 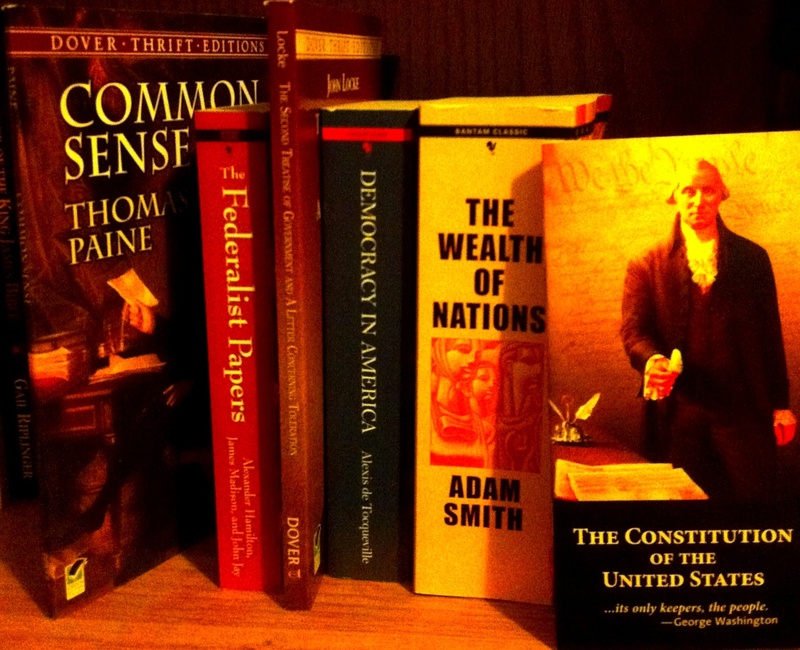 Before tonight, I carried this understanding subconsciously, and it has prompted me to take formal classes on the United States Constitution, debate political topics with unsuspecting co-workers, and has most recently prompted me to read the very source material which our revered founding fathers used to draft the documents that paved the way for our nation to become truly unique and exceptional. The trend I recently discovered is that there is a disheartening, overwhelming disparity between knowledge of current events, and the events that inspired the revolution that spawned our way of life. What a shame. In a vast world of endless corollaries, very few people can make the connections – myself included. All the passion in the world, without contextually accurate knowledge, is ultimately useless. To some, knowledge of the context in which our country was formed may seem irrelevant to the issues at hand. I assert that it is not irrelevant. In fact, many of the most hotly debated topics of our day – if given a fresh slathering of olde time context – could be resolved in a heartbeat, and leave modern progressives completely dumbfounded and powerless in debate. Topics which muster the most deafening amounts of controversy today, crumble to the wisdom of the dead, white men of yesterday. Given enough time, a society such as ours can forget its beginnings, and the cause for its existence. 100 years ago, our country’s history and its foundations were common knowledge. Today, we witness the televised and editorialized moanings of ‘right’ and ‘left’ ideology with no real lens in which to interpret them. The vast majority of Americans – even those who identify as conservative – make their decisions with the belief that our current state of affairs is not as bad as the extremist, fear-mongering naysayers would want them to believe (modern-day Libertarians calling for massive reductions in political laws and government, for example). Examination of history in context, however, reveals that our very founding fathers were the extremist, fear-mongering naysayers of their day. Did their whack-job views result in destruction or prosperity? “Men who look upon themselves born to reign… soon grow insolent… their minds are easily poisoned by importance; and the world they act in differs so materially from the world at large, that they have but little opportunity of knowing its true interests… [and] are frequently the most ignorant and unfit of any throughout the dominions.” -Thomas Paine, Common Sense, 1776. Is the above quote relevant to the current argument? Of course it is! Paine was, of course, talking about British Parliament, but the moral equation is the same as it is today. Doesn’t the above quote stink of our current Congress? The blunders of an aristocracy guided the men who drafted our founding documents to ensure that the trappings of such a government did not adversely affect ours. In historical context, the pundits on MSNBC have no practical argument in their defense. The proven success of the United States as the founding fathers intended, scientifically, morally, and practically shows their liberal ideology to be false. This brings me to the second reason I want to start this blog. I’ve begun to appreciate that mine is a personality which rarely finds someone to challenge it. Even rarer, I can seldom find someone who can challenge me with anything more than emotion and faulty logic to oppose my views. This is my formal invitation to any liberals out there who, conversely, understand why they believe what they believe. I invite and welcome any and all dissent – I only ask that you do the commensurate homework before you square off with me (as proper debate would dictate). This blog is for the resolute (no matter which side you identify with), and for the uncertain. But please, leave the opposition to those who understand the ‘why’. Debating with anyone else is an exercise in futility for everyone involved. Ecclesiastes 1:9 tells us, (NIV) “What has been will be again, what has been done will be done again; there is nothing new under the sun.” I submit that this is true, and as responsible citizens, we should understand what has happened under the sun before we came on the scene oh-so-recently. Our founding fathers recognized the merit in this verse and formed a Republic designed to avoid the pitfalls of every form of government that came before it. Their knowledge and methods beg to be examined. Prudence suggests that we learn what they learned, and discover what they discovered. I do not propose to be an expert. I am merely embarking on a literary journey of the beginnings of our nation in order to imbibe some relevant wisdom for the modern day. I hope to correlate our seemingly nebulous, forgotten history to the ever-growing battle in our society and government. I pray that as I read through what Joseph Andrews lists as “essential documents”, I can relate similarities between the events of 150+ years ago to today. The wisdom which worked so swimmingly those many years ago can yield the same dividends now. I hope that as I embark on this journey, I am able to harness the unconventional wisdom of yesterday as a practical tool for today. Any sentient being in the United States can recognize that there are fundamental problems with our government in its current state. I submit that there is no need to reinvent the wheel to solve these problems; we simply need to unearth the tried and true wheel of our forefathers from the dirt and overgrowth of neglect; the neglect of a nation who has become ignorant, complacent, and dependent on the illusion of safety. I don’t claim any sort of political genius – I only aim to fill the gap between historical context and current events. God, help me prove the value of these writings as I read and relate them to the present day. I ask that you, my fellow citizens, pray the same – not only for me – but for every conservative who desires a practical means to fight the good fight and win our country back. Let’s find out what our country used to look like, and why.